In Britain, the cinema was never more popular - or more important - than it was during the Second World War. This comprehensive and innovative study provides a social and cultural history of cinemas and cinemagoing in Britain between 1939 and 1945, and explores the widespread impact that the war had on the places in which the British watched films. Although promising escape from the hardships and occasional terrors of wartime life, the cinema was so intimately woven into the fabric of British society that it could not itself escape the war. Drawing on a wide range of contemporary sources, as well as the memories of wartime cinemagoers, Cinemas and cinemagoing in wartime Britain, 1939-45 is the first book to offer an in-depth exploration of the ways in which phenomena such as the blackout, the blitz, food rationing, evacuation and conscription on the exhibition industry and popular experiences of the cinema. A landmark in the field of film history, this ground-breaking and accessible book shows that in order to understand the position and significance of the cinema in wartime, attention needs to be paid not only to the films that were watched, but also to the places in which they were screened and the ways in which they were consumed. 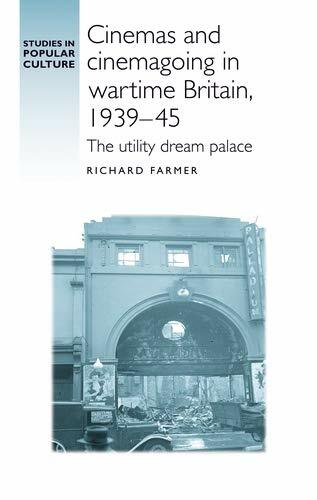 It is an essential resource for scholars, students and anyone wanting to comprehend the intersection of culture, leisure, economics and politics in wartime Britain. 'One of the most significant books on British cinema to appear for many years.' Mark Glancy, Queen Mary University of London -- .